Some stunning news out of Nepal, everyone. On Sunday morning, a 13-year-old girl became the youngest woman ever to climb Mount Everest. The Times of India reports that after a 52-day expedition, Malavath Purna and a fellow student, 16-year-old Anand Kuma, climbed 29,029 feet to reach the peak from the Tibetan side of the mountain. Although Purna and Kuma were led by 10 Nepalese guides, that in no way detracts from this incredible feat. 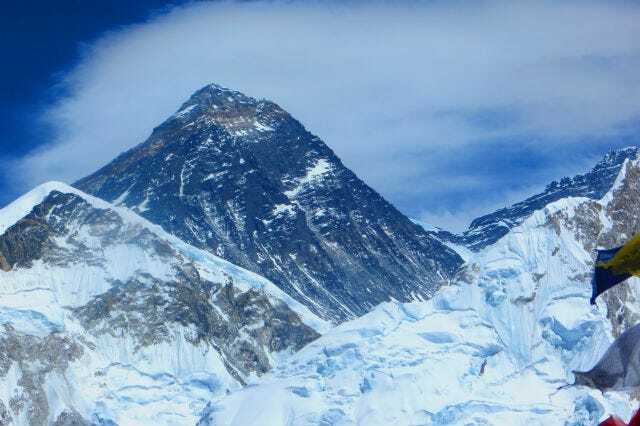 More than 250 people have perished trying to scale Everest, which is by far the highest point in the world from sea level. To give you an idea of just how high these fledgling mountaineers climbed, the Burj Khalifa in Dubai is the world's tallest building at 2,717 feet, which means Mount Everest is more than 10 times that height. The sheer magnitude of that alone, coupled with the huge amount of risks that come in the form of weather, loss of oxygen, and treacherous terrain, make their achievement almost unfathomable. Purna hails from Andhra Pradesh in India, and was sent to Everest by the state's Social Welfare society. She and Kumar were among 150 children chosen for an extreme sports initiative meant to promote "excellence in the students of the society." After Purna and Kuma showed the highest degree of toughness and endurance while training at a mountaineering institute in Darjeeling, they were sent to Everest.